This post is sponsored by Farm Rich. As always, all thoughts and opinions are entirely my own. Thanks for supporting the brands that we love! 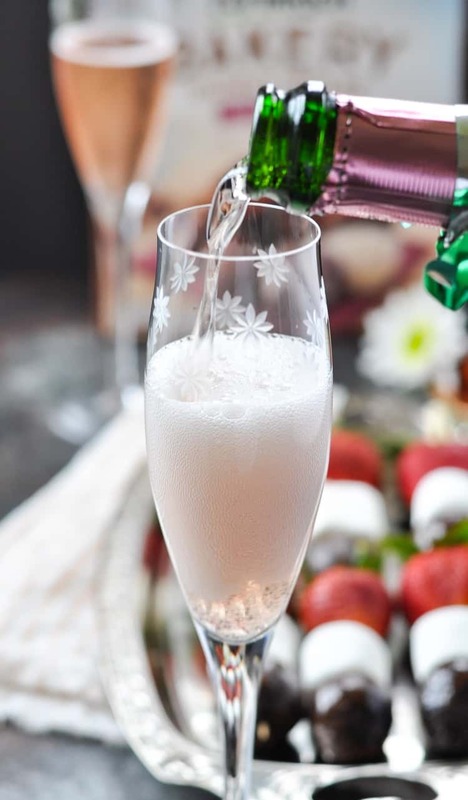 Seriously, is there anything that women love more than chocolate, strawberries, and champagne?! Add in endless time for girl talk and laughter and you’ve got a recipe for success! Today’s sweet treat combines all of these favorites in a simple dish that’s easy enough for a last-minute cocktail hour, yet elegant enough for your next holiday brunch! My friend Hope and I recently co-hosted a baby shower for our friend Mollie. We decided that we had discovered the perfect party-planning arrangement — I was in charge of the food, while Hope was in charge of the venue. I just selected a few of my favorite quick-prep brunch recipes, did the grocery shopping, and then brought everything over to Hope’s house on the day of the event. I considered this the easy task! Hope was the one who had to clean her house (while 3 little kids ran around), set a dining room table with fine china that she hadn’t used in years, and wash all of the dishes when the guests were gone. She was thrilled to not have to worry about the menu, while I was thrilled to not have to vacuum my house! I made my job even easier by selecting only brunch recipes that required minimal ingredients and came together quickly. I knew that I would be transporting the food to Hope’s house, so I didn’t want to be carting tons of groceries or delicate cakes that could be damaged en route. 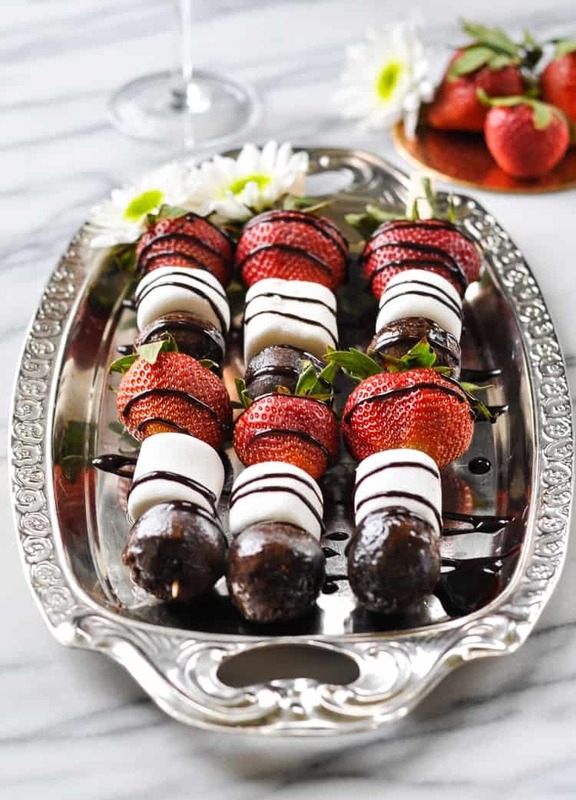 Simple solutions like these Donut Kabobs were fast, elegant, and absolutely delicious! 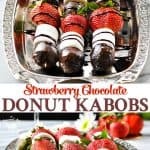 These Strawberry Chocolate Donut Kabobs Could Not Be Easier! 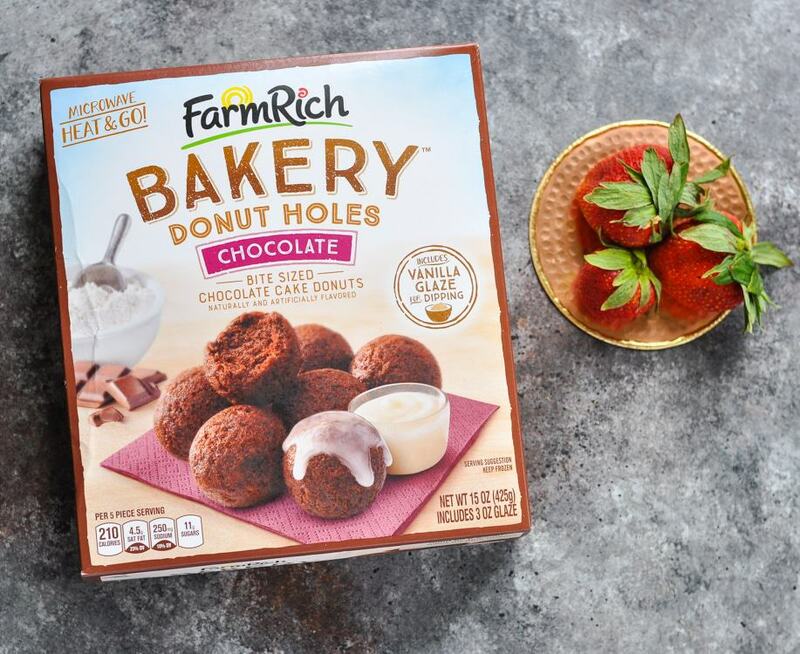 I picked up a box of Farm Rich Chocolate Donut Holes in the frozen section of our local grocery store, which meant that they were fresh and warm when I baked them on the day of the party. They only require about 7 minutes in the oven (or toaster oven), so they’re a great last-minute solution when you want something that tastes decadent and special, but you don’t have time to bake from scratch. Anyone who knows me knows that I LOVE a shortcut! Farm Rich snacks, appetizers, and breakfast foods are made with wholesome ingredients, quick-frozen and carefully packaged so that busy families like ours can prepare great-tasting food in a matter of minutes. If you’re in need of some serious #MomTime, then these products are the perfect way to get some help in the kitchen and cut down on prep time (we particularly love the Farm Rich Meatballs for easy dinners)! I like to use the vanilla glaze that comes right in the box of Donut Holes, but you can certainly skip that step if you prefer. A drizzle of chocolate syrup at the end gives the final product a lovely special touch! Hope was in charge of the beverages at the party, which included coffee, mimosas, and juice. But this bottle of sparkling rosé was the true hit! 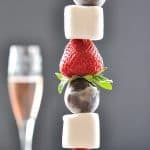 It was the perfect complement to the donut kabobs, and the perfect addition to a Champagne Brunch! 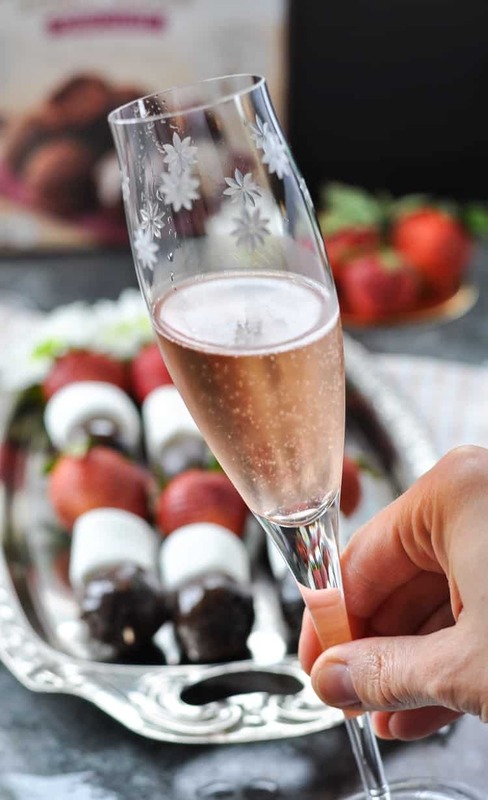 Let me tell you — whether you’re planning a baby shower, a bridal shower, or a Mother’s Day fete, please be sure to pop a bottle of bubbly when you serve these donut kabobs! It is the ultimate way to treat yourself and the ladies that you love! 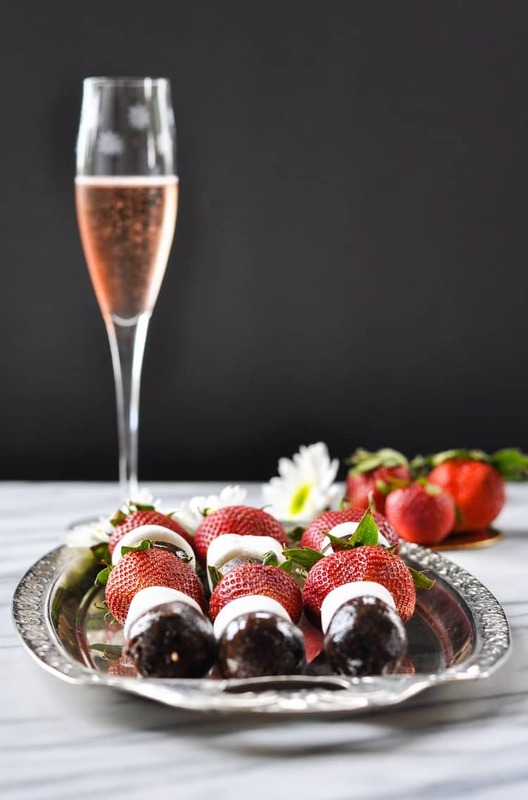 Chocolate donuts + fresh strawberries + bubbly pink wine = a match made in heaven! As busy moms, we all deserve some special time to relax, enjoy uninterrupted conversation with our friends, and indulge in a sweet treat. Whether your children make these Donut Kabobs for you on Mother’s Day or you prepare a batch for your best friends, it’s an easy 4-ingredient recipe that anyone can pull off! Cheers! Heat the donut holes in the oven, toaster oven, or microwave according to package instructions. 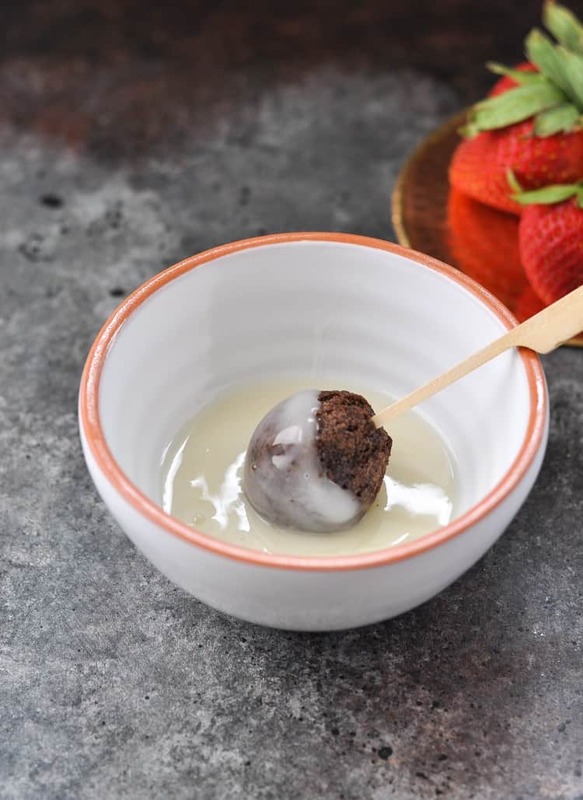 Dip warm donut holes in thawed vanilla glaze. 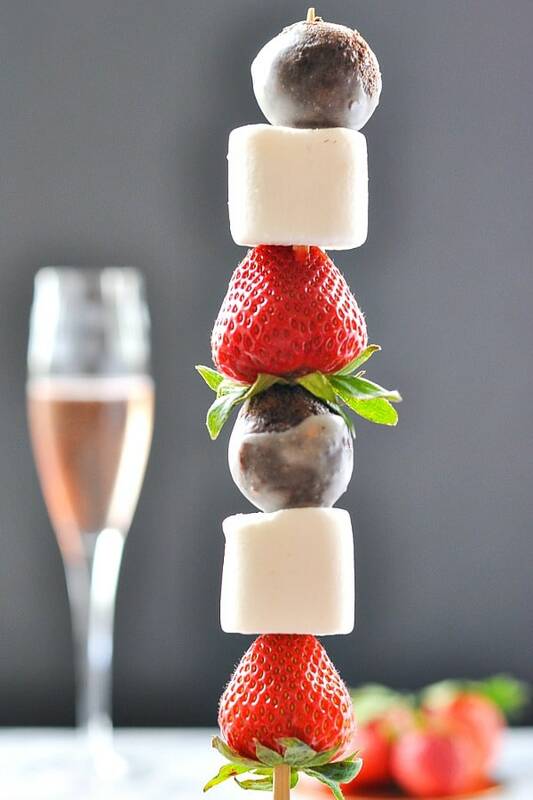 Alternate threading strawberries, marshmallows, and donut holes on a skewer. Repeat with remaining skewers. 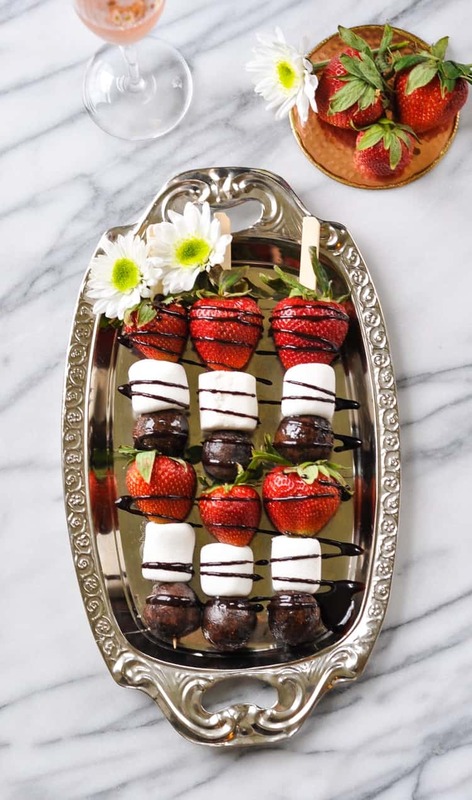 Drizzle kabobs with chocolate sauce, if desired. Ooooooooh! They look so delicious and I cannot wait to try them next time I have to bring a decadent desert somewhere. Now I just have to figure out hope to leave the iPad on this email so that my big boy and little boy get the hint. HaHa! Sorry, I mean how not hope. What a great idea for brunch with the girls, can’t wait to make these!